Asphalt paving is widely used because it lasts longer than most type of pavements with a life span of over 20 to 25 years if laid properly. When it is fully replaced by scarification, the scientist has found a way of recycling this by-product of a petroleum refinery, asphalt is the commonest recycled material in the United States after paper or plastic. It is estimated that 80% of all asphalt pavement is recycled. Asphalt pavement has found application in driveways, gardens, roads, runaways, and the list goes on. Without a doubt, asphalt is the far best choice when considering durability. Asphalt pavement is consist of sand, the stone of different sizes, additives and liquid petroleum. 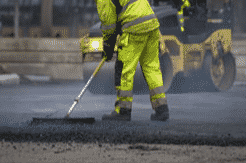 Asphalt which is also known as bitumen has macadam which serves as a glue when paving. This is the active binder that makes all other constituent stick together. This semi-solid substance is viscous in texture. Most pavements consist of 5 to 10 % asphalt mixed with 90 to 95% aggregate and sand while macadam the active agent binds them together. Please note that to enhance the pavement surface performance, the temperature of the asphalt must be maintained to the barest minimum to retain its flexibility. Flexibility is the greatest strength of asphalt pavement, allowing the surface to adapt to varying surface changes caused by weather and soil movements. Asphalt pavement is build surface that it does not retain water on its surface. Water is the chief enemy of asphalt pavement it starts losing its strength when water penetrates through the layers of the pavement. A weigh batching process is used to measure the constituents of the pavement so that the right proportion is mixed. This happens simultaneously as the belt weigher is used in conveying the materials into the batching plant. Next is to dry this constituent well at a standard temperature of 300 degrees in a rotary drying drum. After this process, the aggregates are reweighed to calculate the dry density and see the difference in weight. After the drying process, all materials are moved into a storage facility, commonly silos. The materials are then moved into a mixer where the binding element is mixed. The binder is introduced into the mixing chamber at a steady and measured flow rate. Once the binder is introduced, the constituents mixed thoroughly to form the paving material which is then stored in a silo where heat is constantly applied to avoid hardening. When orders are received from contractors, asphalt is transported gently in dump trucks. From the time asphalt leaves the site to when it is used, the temperature must be maintained around 300 degrees to prevent hardening. Before asphalt is finally applied on the soil it will be used, necessary ground preparation must be carried out. The base materials must be compacted at least 98%, without this, the asphalt pavement life span will be greatly impeded. 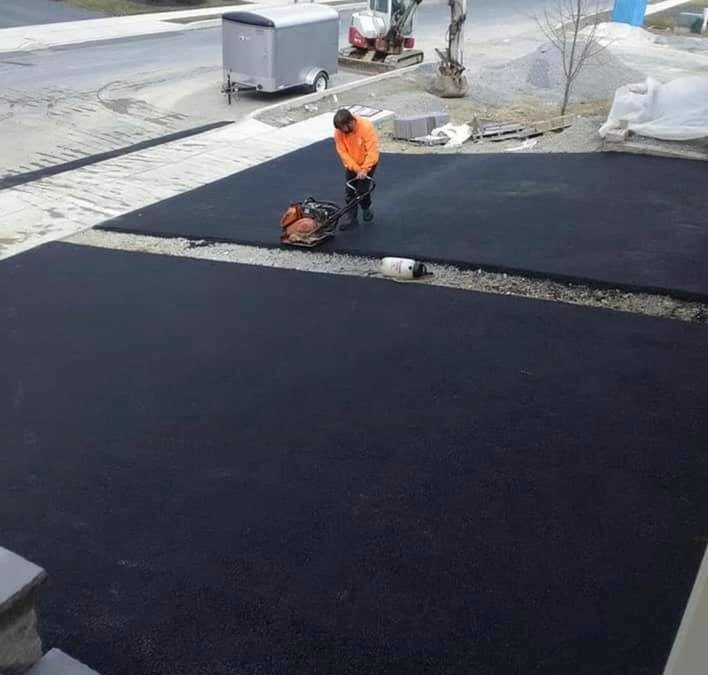 When the asphalt mix is poured on the driveway and has received the required compaction from a right weight roller depending on the thickness of the driveway, it should be allowed to solidify for a minimum of 24 hours and which it can be used for the purpose it was built. When the asphalt paving system is completed, it can be fully exposed to extreme weather conditions without deteriorating. Over time, the asphalt pavement wears, develops potholes, cracking. Maintenance such as crack sealing should be carried out at regular intervals to negate these effects and extend the lifespan of the pavement structure. Contractors pay keen attention to the temperature of the mix throughout the project to ensure that the quality of the project is not compromised. When asphalt loses too much heat, it becomes extremely impossible to achieve the required compaction, long life, and good-looking surface. The temperature of a normal hot-mix asphalt on getting to the site should be between 275 to 300 degrees Fahrenheit. When the first compaction is carried out, the temperature of the mix should be around 220 to290 degrees Fahrenheit and should fall approximately just below 185 degrees Fahrenheit before the last compaction to give it the required stiffness. Although, the wind speed, the atmospheric temperature, and the ground temperature all determine the rate at which the asphalt released heat. When pavements cool faster than normal, it will not attain the required density it needs to bind together so that water its major enemy will not penetrate through the pavement layers leaving it also with a rough surface. Please note that job carried out in extremely cold weather requires more rollers e.g wide rollers. 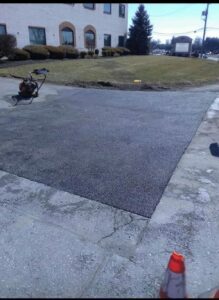 Asphalt paving is a strenuous work that not only demand being detailed but long hours on the field. Wearing an asphalt boot that serves you well with the good surface will provide you with ease and comfort. To determine the right boot to wear is critical to your comfort whether it is made locally in your country or imported. We will be taking you through some features that you should at when deciding on which asphalt boot to purchase. In as much you will be wearing your asphalt boot for a long time, you need to ensure that it fits you well. A shoe that is oversized or undersized will result in safety complications or severe discomfort. Check out for the sole of the asphalt boot to ensure that it has sufficient clamping with the foot fall. Meaning that the boot should not flop when you are on site and also your foot should not rub against the inner surface to avoid irritation. Ensure that both the inner and outside of the asphalt boot materials can withstand heat emanating from the asphalt when paying. It is important that the material is a heat insulator as such your foot does not get heated up during paving. Some asphalt boot comes with a thermic sole that repels heat from outside with the aid of a Polyurethane compound. This innovation has been tested to resist heat up to 300 degrees. When deciding on the choice of asphalt boot to buy, you must ensure that the sole design does not get clogged with pebbles, stones, asphalt, and tar. This material is can cause an accident when not properly limited. Another benefit of the flat sole is that it gives no impressions or print on a newly paid asphalt pavement. Without no doubt, an accident can only be prevented and not totally eradicated. Any asphalt boot must be made with a safety toe made of composite and quote; fiberglass and nylon materials unlike steel used in the other construction process. This is to limit heat transfer through conduction. This prevents hot oil, hot tar, and stone from getting into the shoe through the tongue lace area. When asphalt is heated to a temperature of 300 degrees, it will fry up the human skin. A full gusset will keep the feet dry during construction. A full gusset shoe tongue is important because the design prevents stones, hot tar, and hot oil from getting into the shoe through the tongue lace area. At 300 degrees, getting hot asphalt into the shoe could cause serious injury. A full gusset will also keep feet dry if you stepped in a puddle or have rainwater running down your pant leg. When Did They Start Paving Streets With Asphalt? According to Tilson, says that the Carthaginians(about 600 B.C) located in the present day Tunisia are the first to construct and maintain a good driveway system. Then followed by the Romans who practiced a military road system which connected camps. It was recorded that the Romans built an estimated 87, 000km of roads throughout its existence this is about the length of the U.S interstate system. The United Kingdom which later became a world power had no record of traditional roads as most of the roads were military roads built by the Romans soldiers. Since the primary purpose of military roads was for foot soldiers, they were not crooked but generated so much noise with evidence of intensive rough surface. As the year goes by, the thickness of roads decreased from 0.9m to 350 to 450mm according to Telford, a British engineer. The dimension further reduced to about 250mm according to Macadam specifications after another British engineer, Tar Macadam. The standard from MassachusettsHighway Commission is 150mm and this is also adopted by the New York state roads. Initially, tarmacadam pavement, the first kind of asphalt-pavement was only suitable for light traffic and not urban streets. Coal tar was then introduced in 1800, a residual from coal gas-lighting which was recyclable and was used for huge traffic roads. Frederick J. Warren in 1901 and 1903 patented the early hot mix asphalt material which is still used in many parts of the world. Following a typical mix of 6 percent bituminous cement and the aggregate of various grades. The maximum aggregate size was 75mm ranging down t dust. This material became what is called Bitulithic. 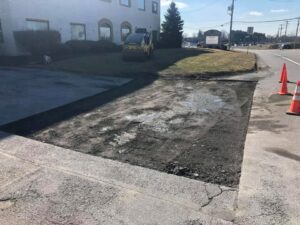 What Is The Cost Of Paving A Driveway With Asphalt? When your landscape fits well with your driveway, it makes the entry point into your house good looking. A driveway might be perceived to be expensive, but in this article, we will explore the cost implication of an asphalt driveway. The cost of related activities such as land preparation might differ from region to another but avoiding construction during peak periods which could be summer will save you a lot of money if you sophisticated equipment’s to predict weather conditions. Let’s dive into elements to consider when determining the cost of paving an asphalt driveway accordingly. Usually, 9 to 10 feet wide is enough for a car but if you have a lot of vehicular movement in your house. Then you have to consider a double lane. A driveway typically extends into a truck C road or a street curb into the garage in your home. The square footage is an important factor to consider when determining the cost of the pavement. Cost of renting special equipment make a driveway less than 10 feet costlier than other sizes. Removing the natural ground or soil involves clearing shrubs, dirt and getting a new driveway under construction. The process can be time-consuming if not properly planned. The cost will vary depending on the type of soil being considered. It is estimated at $2.5 to $5 a square floor. Although if in the course of excavation, you go below a frost line, you will be charged more. The cost of a very standard base for a small 15 by 320 feet driveway with 3 in of gravel might be around $250 per base. Quality gravel base is important to make a driveway, no matter the surface material selected. Depending on the length of the driveway, it can cost as high as $1,000 or more. The stability of the gravel is a function of the gravel base. This is where you pour the asphalt on the compacted gravel base. It costs an estimated $5 to $10 square foot to complete an asphalt surface depending on the thickness. But this can vary depending on the region and the how deep the concrete is. You should project at least 4 inches of concrete, thicker if you will have heavy vehicular movements. What Is The Average Cost Of Asphalt Paving? Asphalt paving comes in different length and width. 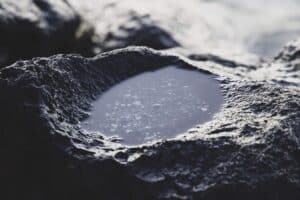 They can be quite expensive to pave and maintain, and though gravel is a very low-cost option, a majority of homeowners will usually consider asphaltic materials for their durability. The costs and requirements for the creation of a 600 square foot driveway that is roughly 12’x50′ in size are $830. However, prices will be higher if the area has any slopes or curves. Asphalt 1 – asphaltic concrete 3 is usually installed at a depth of no less than 2″. For this project, the asphalt 1 is at 2.5″ and would cost roughly $830 installed. This tends to have a lifespan of 10 to 30 years and will need treatment every six to ten years to maintain its good looks and durability. This is known as a macadam 3 treatment and will average around $2 per square foot, or roughly $1200 every six years. Curves, slopes, and water – when a driveway must be prepared with any curves or slopes included it will automatically increase labor and material costs simply because of the additional effort and design involved in such a process. Should this same driveway need to cross over a body of water such as a small stream or marsh, the use of appropriate drainage, ditches, etc. will also increase the total project costs substantially too. This sort of construction and engineering will also need approval from a wetlands or planning commission, and this is going to have to be addressed long before the project begins. Keep the following elements in mind as you look for a reliable asphalt paving contractor near you. Driveway Size: Considering asphalt is usually priced by square feet, the larger your driveway, the more asphalt is required. Therefore, the easiest way to lower your asphalt paving prices is to install a smaller driveway. 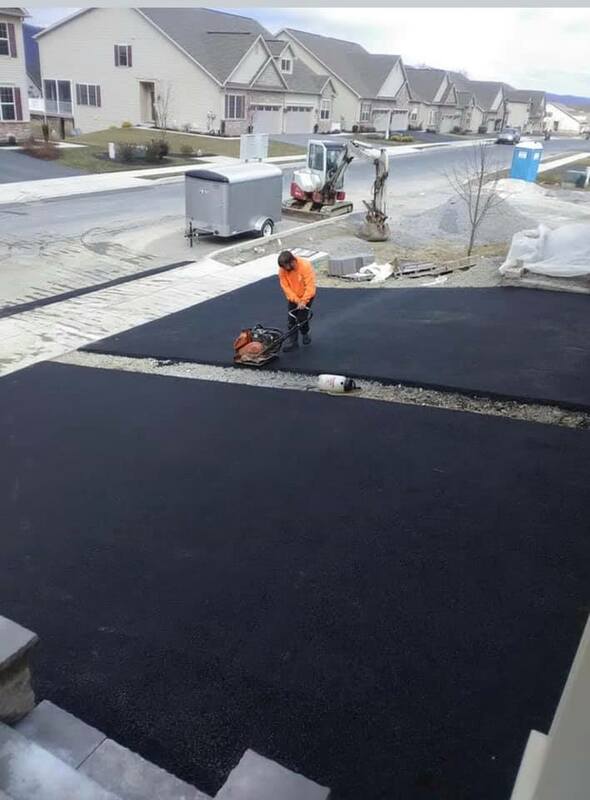 Initial Driveway Installation: If there has never been a driveway at the desired location. The preparation of the ground will add to the cost and timeline of the project. On the other hand, adding a layer of asphalt over existing asphalt will cost less than the initial installation of a driveway. Coats: You can get as many coats of asphalt as you wish, in addition to colored or stamped top coats if you prefer. Each coat adds an additional $1 per square foot, while colored top coats add at least $3 per square foot. Assuming you hire a pro. The cost to install an asphalt driveway typically ranges between $3,000 and $7,000, with an average of around $6,400. The topsoil needs to be removed so that borrowed soil of high compaction quality will be used to replace it — This is carried out using an excavator and a bulldozer. When the topsoil is removed to the desired depth usually between 900 to 1200mm. When Asphalt Street is scraped, it is recycled and used in the production of similar bitumen which is returned to the market for use. This cycle continues and it aids the reduction of consumption of natural resources. Bitumen which is found in nature is heavily depended on for the production of new asphalt. On average, it costs between $1.49 and $1.69 per square foot to pave an asphalt parking lot. Striping, marking, and curbing will come at an additional cost. Ignoring any maintenance costs, asphalt is generally much cheaper to install than concrete. On average, the cost per square foot for asphalt will run between $2.50 to $4.00. Asphalt requires re-sealing every three years or so. Low-end sealants cost around $5 for a five-gallon bucket and cover around 400 square feet of asphalt. High-end sealants can cost upwards of $20 per bucket depending on the size. Fluctuations in crude oil prices can cause fluctuations in asphalt prices but the price will remain around this range. Concrete, on the other hand, can run between $4.00 to $6.00 per square foot for basic installation and can cost more depending on different finishes and detail. It’s not unheard of to have a stained concrete driveway with a smooth finish cost over $15.00 per square foot.